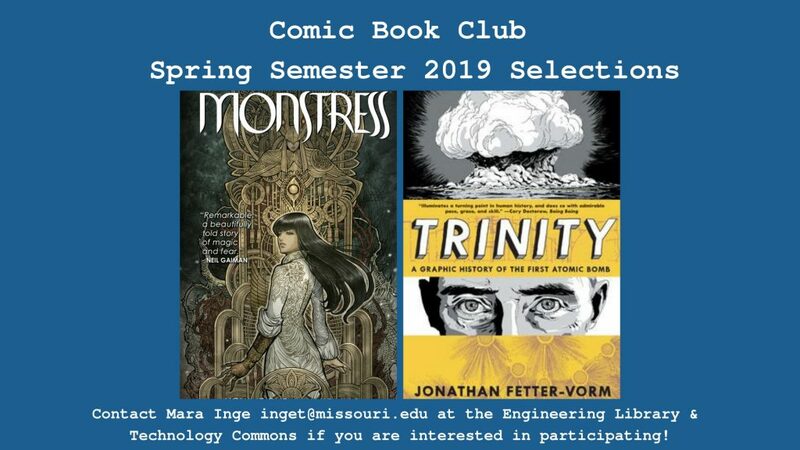 Did you know the Engineering Library has a Comic Book Club? This semester we will be reading Monstress, written by Marjorie Liu and illustrated by Sana Takeda. Monstress is set in 20th century Asia and tells the story of a teenage girl who shares a psychic link with a powerful monster. Gorgeously illustrated in a style best described as art deco meets steampunk, this comic has garnered awards for its art as well as its storytelling. The story includes magical creatures, sorceresses, and cat wizards. We will also be reading Trinity: A Graphic History of the First Atomic Bomb by Jonathan Fetter-Vorm. Trinity tells the history of the race to build and the decision to drop the first atomic bomb. The story takes you from 19th century European labs to the various locations of the Manhattan Project. It has been described as both a graphic primer and a philosophical meditation. You do not need to be an engineering student to participate in Comic Book Club nor do you need to be well-versed in the world of comics and graphic novels. We welcome all majors and all levels of interest! Contact Mara Inge (inget@missouri.edu) at the Engineering Library if you are interested.